The earthquake and tsunami that hit Palu, Central Sulawesi and the surrounding area, on September 28, 2018, became one of the grief events felt by Indonesia. There were 2,073 people who died, 10,679 people were injured and 82,775 people became refugees (reported from bbc.co – red). 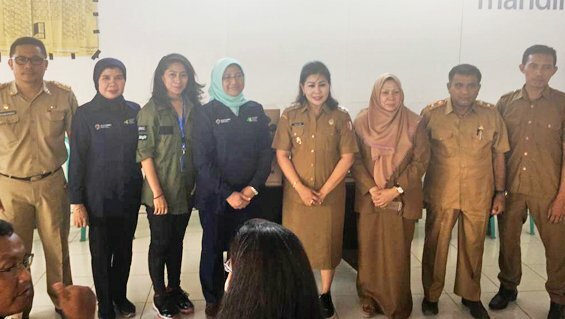 Enesis Group through its Corporate Social Responsibility (CSR) program “Enesis Peduli”, distributed aid to victims in Palu in collaboration with the Indonesian Ministry of Health and Aksi Cepat Tanggap (ACT). The assistance is in the form of refugee tents, thousands of t-shirts and blankets, as well as hundreds of cartons of Enesis Group products such as Antis, Soffell, Proman, Coolant, and Adem Sari Ching Ku. On Monday (5/11/18), the assistance from Enesis was submitted directly by Elkana Lewerissa (Public Relations Head) to the Director General of Public Health, Dr. Kirana Pritasari, MQIH. The donation was held at the refugee camp in Sibalaya Village, Palu, Central Sulawesi. “This assistance from Enesis for Palu is one form of real concern for the refugees and victims of the Palu earthquake and tsunami. Besides that, it is also a commitment to always support Government programs, especially the Ministry of Health, “Elkana said. Copyright © 2018 Enesis Group. All rights reserved.